Supplied as 6 metre lengths with 15 feed positions per unit. Gap of 400mm per animal makes for a very strong feed fence that will allow 10 to 12 animals, dependent on breed and size, to feed per length. 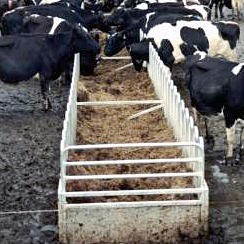 For 100 dairy cows the unit would be 30 metres in length x 1.5 or 1.6 metres wide. Delivered as 10 x 6 metre lengths, 2 feeder ends, 9 braces and 12 pins. This 600 cow herd is fed in four batches of 150 cows during milking by having an extra holding yard between the milking area and the feed pad. It takes 25 to 30 minutes to milk 150 cows and also allow 150 cows ample feeding time at the feeder which in this example is filled once every two days by dropping two electric wires and putting the silage bales direct into the feeder. This could just as easily be filled from a big bunker of silage.